SuperCasino has made its name as a leading live casino with television broadcasts part of its USP. You can get involved with this casino in live real-time via your television on both Channel 5 and on selected sky channels. The TV broadcasts are usually throughout the early hours of the morning and the TV shows specialise in broadcasting just the roulette games, whilst there are many others you can enjoy when you sign up to the site and get stuck into the range available on their solid online provision too. The slots provision at the site is of a really high quality, with a choice of recognisable games including the Marvel slots range from Playtech and many other recognisable names including big-money progressives which could make you very rich indeed. Other games to be enjoyed on the site include a wide range of different blackjack variations, baccarat, craps and even more unique and obscure games like Soho Mah-jong. 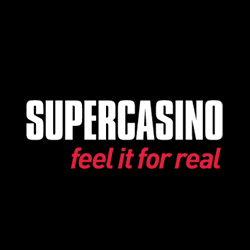 SuperCasino doesn’t disappoint video poker players either with both single and multi-hand games available and all of these games are offered with a classic, online casino environment which has been well-designed to ensure every player enjoys seamless gameplay and easy access to all their favourite games. SuperCasino made its name through being a 24-hour provider of great entertainment and fun gaming and this doesn’t stop when it comes to customer support. You can reach customer assistance 24 hours a day, 7 days a week through a range of methods including live chat and Freephone telephone number. They have an attitude which seems like nothing is too much for them which is a fantastic quality in an online casino and matches up with their lively and welcoming approach to their television broadcasts too. Whilst SuperCasino is known for being a TV broadcast casino and a specialist in live casino but this doesn’t mean it lets you down when it comes to traditional online casino gaming and very few players are disappointed by their experience at the site. This casino is powered by a combination of specialist live casino software as well as offering Playtech and IGT games. The loyalty club at this casino is by invitation only and becoming a VIP is something which may come your way if you’re particularly loyal and keep coming back to the site. Once you receive that golden invite you will enjoy an increased level of comp points which can be converted into cash, gifts, bonuses and cashback and you will also receive 24-hour access to the VIP management team at the site. As you move up the tiers from entry level to Bronze, Silver, Gold and Platinum the benefits will just keep increasing. Making a deposit at SuperCasino is extremely straight forward and all you need to do is choose between the payment methods available and deposit at least £10 and you can continue enjoying your favourite games. Withdrawals at this casino are a little less clear than other sites and they have a relatively limited number of withdrawal methods, all of which should be familiar to their users. You can choose between credit cards, debit cards, Skrill or Neteller to make payments at this site and the bank accounts you use must be the same ones as those you made a deposit with. It’s not too complicated but it is limited when you consider what other casinos offer. This casino is regulated by the authorities in Alderney which guarantees it is a white-listed casino for UK players.